Carly has been doing wonderful for over two years since starting CBD Oil. In fact she has had great success on the oil. Myclonic seizures are non-existent, complex partials have all but gone away and her cognitive abilities have improved greatly. Not to mention her EEG has seen vast improvement. However, Carly has been down a rough road for the last several weeks. The generalized Tonic-Clonic seizures have reappeared. For those that do not know, Tonic-Clonic aka Grand Mal, are the really tough to watch, hard on your body convulsing seizures. In my book they are the worst of the worst. She had her first reappearance several weeks ago. As her parents we tried to stay positive thinking these were a "one and done" type of thing and they would go away. But that is not the case. The tonic clonic's are occurring just about daily and are scary as hell. 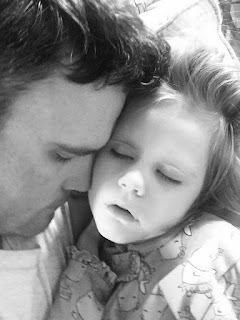 We are not taking her off CBD Oil but Sudden Unexpected Death from Epilepsy(SUDEP) is always in the back of our mind and scares us. We have been to see the team of doctors at UAB and are currently working with them to come up with a plan to stop these awful tonic-clonic seizures. Our sweet butterfly is tangled in a spider's web but our resolve will never fade. Blessings to your sweet girl. I will continue to pray for Carly. I'm so sorry...y'all are amazingly strong parents. Praying for Carly. Praying for this sweet baby, and you guys!!! May God give you strength and peace during this difficult time. My son is light-sensitive as a symptom of his LGS and his generalized tonic-clonic seizures are easily induced by light. This only developed a few years ago, despite his having LGS for the past 23 years. We keep him in low light--definitely away from overhead bulbs or out of the sun. If he still has them, as soon as they begin, we VERY GENTLY stroke the neck area just under his LEFT EAR (where a vagus nerve stimulator would be) with our fingernails. This usually, terminates the generalized seizure. He often pulls his head hard to the right and tries to induce seizures by blinking his eyes rapidly. Gently raising his head upright (straight) prevents the onset. It can also be combined with the gentle fingernail strokes to the neck under the ear. I should have mentioned, we also go to great lengths not to stimulate him to excitement. In the morning, we are silent and use gentle touch instead. He spends a lot of time outside in his swing that is under cover with a canopy. Being outside stops his myoclonic seizures in the Summer, but they return in the Winter as a result of not being able to exercise in his swing outside. There are so many things you can do to modify the environment, your behavior and your child's, to prevent seizures. My heart is with you. Fighting the fight every day! oh friend! I know this is hard after so many leaps forward. Praying for the new plan and ideas for doctors. Love that sweet Carly! Hugs to your family!